Win a Pair of Tickets To Sunday’s Falcons-Panthers Game From Visa! 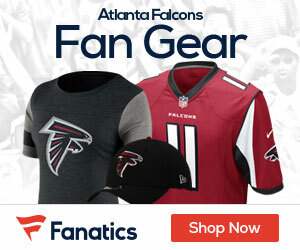 The Falcons are maybe the hottest team in the NFC, and now you can be at the Georgia Dome to see them LIVE this Sunday when they play NFC South rival the Carolina Panthers! The folks at Visa are giving Falcons Gab two FREE tickets to the game this weekend to cheer on the Falcons as they look to get to 4-0. What Falcons Running Back Set the Teams All-Time Franchise Record Back on December 6th, 1987, passing William Andrews? Again, mail your answer to matt@nflgridirongab.com ALONG with your MAILING ADDRESS so Visa can mail the tickets out to you! We will pick a winner at random early Thursday! Visa Inc. (NYSE: V), a proud sponsor of the NFL since 1995, marked the kickoff of the 2012-2013 NFL season with the introduction of Visa NFL Fan Offers, a new program that uses real-time communications to give enrolled Visa cardholders a chance to win exclusive NFL-related experiences as well as receive valuable merchant offers. The program is a central component of Visa’s new NFL marketing campaign, Make it Epic, in support of its NFL sponsorship which includes national television and digital advertising, social media engagement, issuer activation programs and NFL team relationships. Visa NFL Fan Offers was specifically designed to enhance the NFL experience for fans, bringing them closer to the action through a series of epic giveaways. In the Visa NFL Fan Offers Sweepstakes, enrolled cardholders have a chance to win epic experiences ranging from rare access to John Madden’s viewing studio or an NFL coach’s gameday speech, to trips to the Pro Bowl and Super Bowl XLVIII (2014). The program will also deliver timely merchant offers to NFL fans to fuel their passion for the game with discounts on pizza, NFL gear and EA SPORTS™ Madden NFL 13, for example. With Visa NFL Fan Offers, Visa can customize NFL fans’ experience based on their favorite team and enrolled card usage.